Everyone loves to blame and shame the airlines for their travel woes, and there has been plenty of poor behavior to warrant this year’s ticker tape parade of complaints. But before you pig pile your anger on the carriers, take a good look in the mirror. You may not have thrown any punches or tried to bring a birthday cake on an airplane, but perhaps you’ve unknowingly sprayed a bit of lighter fluid on the charcoal briquettes of airport anxiety through some of your actions. I’m not here to make you feel bad, unless you’re a chronic seat recliner or have a predilection to remove your flip-flops at 30,000 feet. Instead, think of me as your fairy godfather (no jokes please), as I offer you some solid advice on how to be a better passenger. Stop shuffling the contents of your suitcases at the ticket counter. Last year airlines raked in staggering $4.8 billion in baggage fees, which means your bag will be carefully weighed at check-in. Airline websites clearly state weight limits for checked bags. Still, there are plenty of fliers who skim over that detail and show up with suitcases that are heavier than RuPaul’s make-up case. No one wants to pay additional fees, so the overweight suitcases are opened and extra clothes are redistributed into carry-on bags or between spouses’ suitcases. Unfortunately this is happening at the counter, while others are forced to wait in line and watch the suitcase shuffle. If you find yourself in this dilemma, pull your bags to the side and let the next person in line step forward. Better yet, weigh your bags before you get to the airport. You’ve been assigned a seat (except if you’re flying Southwest) and no one is going to take your seat (unless the flight has been oversold), so keep those elbows to your sides and proceed in an orderly fashion when your group number is called for boarding. If you’re worried about space for your carry-on, check it at the gate. Breathe deeply and remember you’re getting on a plane, not trying to get a $99 flat screen at Walmart on Black Friday. I’ll never understand why some people take an inordinate amount of time to arrange their belongings and sit down. Jiminy Christmas, just put your carry-on in the overhead and plant yourself. What’s so complicated? Instead, there is a breed of lingering Larrys who play Tetris with their non-regulation carry-on, fuss with their coat, pull out their laptop, and stand in the aisle and bicker with their spouse as a queue grows behind them. Even when flight attendants tell them to get their slower-than-molasses derrieres in their seat, they continue to block traffic like an overturned 18-wheeler at rush hour. Don’t let your carry-on become a weapon. I know this sounds like an easy one, but with narrow aisles it’s common to thwack unsuspecting shoulders and legs as you walk to your seat. More importantly, try not to drop your luggage on someone’s head as you store your carry-on. I was unaware this regularly happened, but a study from Jet Cost found that dropping overheard luggage onto a fellow passenger’s head topped the list of the 10 most awkward flight situations. Don’t grab on to the seat in front of you when you stand up or sit down. The seat in front of you is not there to support you when you stand on a plane. There’s someone sitting in it, and whether they tell you or not, they’re probably very annoyed when you’re grabbing and pulling it back to hoist yourself upward. When you release it, they spring forward. You may have noticed that those airplane seats aren’t exactly solid. Unless you require extra assistance, push yourself up by your armrests. That’s why they were put there. Never, and I mean never, make others endure your bare feet on a plane. 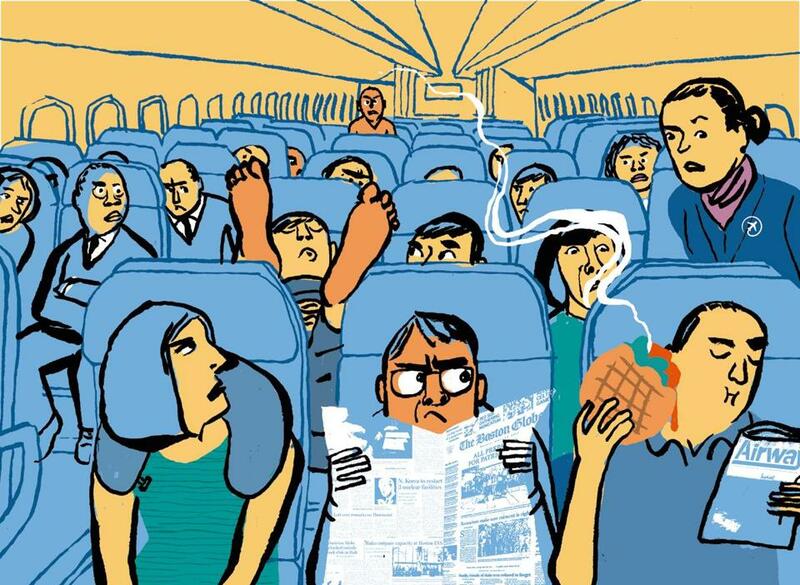 Don’t bring smelly food on a plane. Buying food on a plane is insanely expensive. I get it. I never buy it either. But bringing smelly fast food on a plane is almost as obnoxious as paying those high prices. I’m not saying you should starve on your flight, but maybe forgo bringing the Taco Bell double chalupa or the Burger King onion rings into the cabin. Try a sandwich, or something that won’t invoke the olfactory anger of your fellow passengers. Bonus, it’s healthier than those fast-food stink bombs. Try not to dress for the plane as if you called in sick to work. No one expects you to show up for your flights in a spiffy twin set and pearls or a tweed jacket. It’s not Passover, it’s a plane. But for the love of Mike, pajama pants for a day flight are a bit much. I don’t take umbrage with leggings or even joggers, but there’s a fine line between comfort and dressing like a big ol’ nasty slob. Jacqueline Whitmore, a former flight attendant, etiquette expert, and founder of the Protocol School of Palm Beach told me that those who dress well are treated better by staff and have a better chance of getting upgraded when they don’t look like they selected their ensemble from a pile of dirty laundry. Don’t recline your seat in economy. You have no right to glare at someone else’s screaming baby. It’s a baby. It has no idea why its ears are popping or why it’s surrounded by scary adult bare feet. “Refrain from giving the parents long glares,” says Sharon Schweitzer, an international etiquette expert and author. “They know their child is being loud and your stare won’t stop it.” But if you have a toddler or child kicking your seat, then by all means turn around and speak with the parent. I find they’re usually very understanding if you ask nicely. Don’t be a jerk when it’s time to disembark. There are those (and you know who you are), who dash like Usain Bolt to the front of the plane when the captain turns off the fasten seat belt sign after landing, cutting off everyone else. This starts a cut-off chain reaction. There is a better system. Passengers should leave row-by-row. Unless you need to make a connecting flight, get off the plane like an adult. You’re not the only one who wants to escape from a metal tube that smells like Burger King and feet. Ma’am, please step away from the baggage belt. It doesn’t matter where I stand at the luggage carousel (does anyone still call it a carousel? ), there is inevitably someone who steps in front of me as I’m waiting for my suitcase. When I step away to find another place, someone else stands in front of me. I usually end up elbowed out of the way completely — and pining for a pair of binoculars to locate my suitcase over the throng. Unless you’re going to miss a bus, there’s no need to crowd out your fellow travelers.